Roger Page Cricket Books and Memorabilia December 2017 Catalogue has now been released with a new range of cricket books for everyone. The catalogue is available every two months. It contains a large range of cricket books on a wide variety of subjects relating to cricket. Roger’s cricket book catalogue is available in a number of formats. By hardcopy through the post. 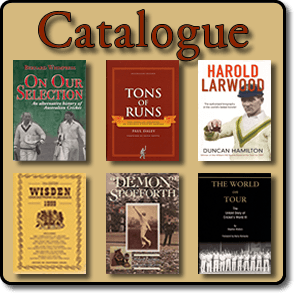 Roger Page Cricket Books and Memorabilia October 2017 Catalogue has now been released with a new range of cricket books for everyone. The catalogue is available every two months. It contains a large range of cricket books on a wide variety of subjects relating to cricket. Roger Page Cricket Books and Memorabilia August 2017 Catalogue has now been released with a new range of cricket books for everyone. The catalogue is available every two months. It contains a large range of cricket books on a wide variety of subjects relating to cricket. Roger Page Cricket Book’s June 2017 Catalogue has now been released with a new range of cricket books for everyone. The catalogue is available every two months. It contains a large range of cricket books on a wide variety of subjects relating to cricket. If you would like an electronic copy (soft copy) of Roger Page Cricket Books, please email Roger or complete the enquiry form on this website. Roger Page Cricket Book’s April 2017 Catalogue has now been released with a new range of cricket books for everyone. The catalogue is available every two months. It contains a large range of cricket books on a wide variety of subjects relating to cricket. Roger Page Cricket Book’s February 2017 Catalogue has now been released with a new range of cricket books for everyone. The catalogue is available every two months. It contains a large range of cricket books on a wide variety of subjects relating to cricket. Roger Page Cricket Book’s December 2016 Catalogue has now been released with a new range of cricket books for everyone. The catalogue is available every two months. It contains a large range of cricket books on a wide variety of subjects relating to cricket. 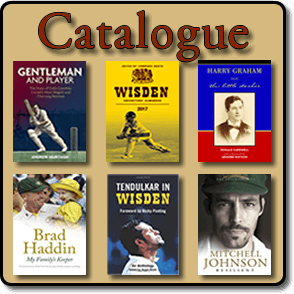 Roger Page Cricket Book’s October 2016 Catalogue has now been released with a new range of cricket books for everyone. The catalogue is available every two months. It contains a large range of cricket books on a wide variety of subjects relating to cricket. Roger Page Cricket Book’s August 2016 Catalogue has now been released with a new range of cricket books for everyone. The catalogue is available every two months. It contains a large range of cricket books on a wide variety of subjects relating to cricket. Roger Page Cricket Book’s June 2016 Catalogue has now been released with a new range of cricket books for everyone. The catalogue is available every two months. It contains a large range of cricket books on a wide variety of subjects relating to cricket.